These German occupation issues are referred to in Michel as "Etappengebiet West", or literally "Staging Area West". Here, it will be called the "Western Command". The Scott Catalog lists these under France, as occupation issues, which is not completely true. The Etappengebiet West is what the Allies referred to as East and West Flanders (in Belgium) and French Flanders (near Calais). These issues were intended to pay postage on mail originating from postal facilities in the Flemish areas. Some of the heaviest casualties of the war on the Western Front occurred in this area, especially around Ypres. Though contemporary books such as "All Quiet on the Western Front" and poems such as "In Flanders Fields" focused on this phase of the war, the heaviest losses of life were actually in the campaigns in Eastern Europe against the Russian Empire. A 10 Centime hand-stamped forerunner was used by the German military government in Flanders between September 8 and October 30 1914. The stamp is very scarce and high priced. It is described in the Michel Deutschland-Spezial-Katalog at the beginning of the Etappengebiet West section. On December 1, 1916, twelve denominations of the contemporary German definitive stamp issues were re-valued in Belgian Francs, for use in the Western Command areas (Mi. #1-12, Sc. France #N15-26). Seven of the stamps are shown in the image above (Mi. #1-6, Sc. France #N15-21). They were used concurrently with the occupation issues for Belgium. 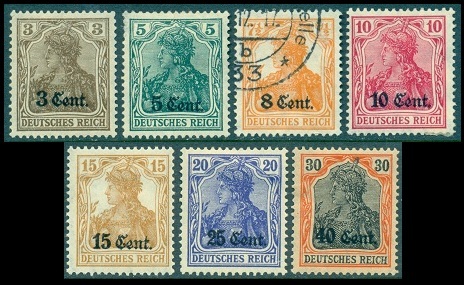 As with the other wartime issues of this German definitive postage stamp set, the stamps come in varying shades. The surcharged Mark values also come in both the 26 x 17 perforation holes and 25 x 17 perforation holes varieties. None of these issues are terribly scarce, and most of them are very reasonably priced. There are some other printing varieties footnoted in Michel which are quite scarce.